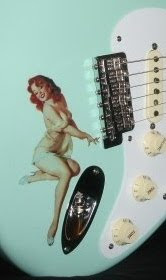 G&L's Phyllis Fender "Blondie" Limited Edition model was a 100 unit run in 2007. The headstock is signed by Phyllis Fender, widow of the late Leo Fender. Mrs. Fender holds the title of Honorary CEO at G&L Guitars. Click the image to find out more about her humanitarian efforts and the part this limited edition guitar played. Leo Fender commonly referred to his wife by the nickname "Blondie". Guitar Adoptions currently lists a Blondie, just loaded with great features and many extras, making for one serious bling guitar package! Proving that beauty is more than skin deep, the pearl tuner equipped Blondie also features a two piece swamp ash body and much much more to love. Only 100 exist. G&L has a gorgeous line on which we'll be focusing more in the near future.